Wow, really inspirational. Looks like a beautiful place. I really hope to one day begin climbing some of the 7 summits… I\'ve got tentative plans for Kilimanjaro in the Spring. Gorgeous, gorgeous shot!!! I like the contrast of the blue sky, the snow of the mountain top and the green hillside. I did not know you climbed Elbrus from the north side. You know I love the route less traveled! 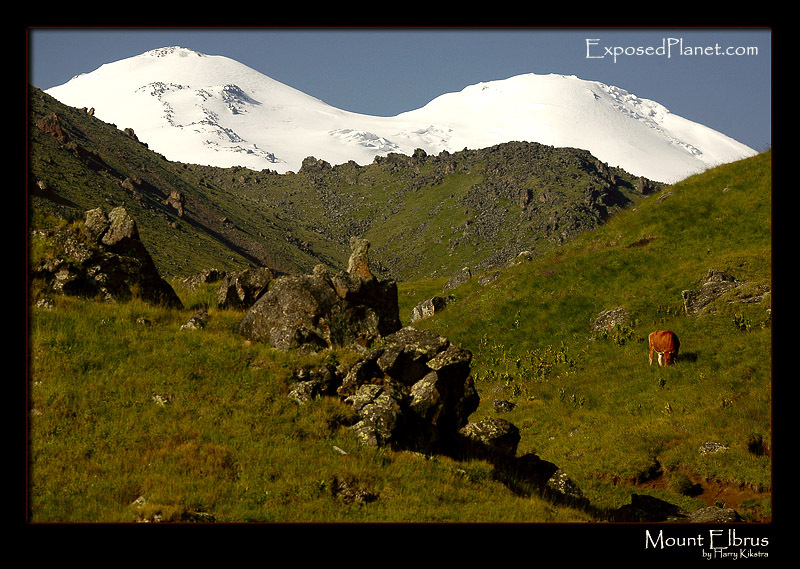 Maybe Elbrus one day….. The story behind "Mount Elbrus, Russia from the North"
Mount Elbrus is the highest mountain of Europe and therefore one of the 7 summits. Usually it is climbed from the busy South side, where the cable cars, chairlift and snowcat of the ski area make the ascent shorter and easier. We decided to use the North side, where the slopes are still green, and no smell of diesel is filling the air. It is a beautiful area, with only the mighty two peaks of Elbrus sticking out. Here you have to climb every metre yourself, which is tough, but so much more fulfilling!